company profile-about us-Anhui New Changes Automation Equipment CO.,LTD. We are an integrated supplier of a commitment to provide one-stop integrated service for assembly,manufacturing enterprises. By virtue of integrity and pragmatic,enthusiastic service,won the trust of many enterprises,and establish a long-term strategic cooperative partnership.We provide with industrial automation equipment manufacturing,electronic materials and technology,the full range of services. We take ht emarket pricing of the most reasonable,with the most sincere service,look forward to working with you! 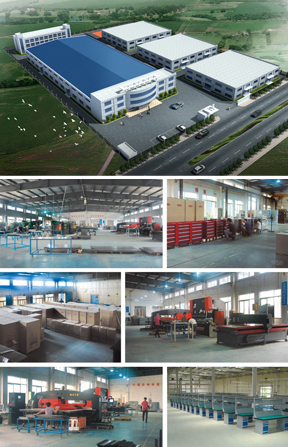 Anhui new automation equipment Co.,Ltd is a profes sionall mechanical and electrical integration planning,design,manufacture,installation,service and integrated group company. The company was founded in 2005 China financail center in Shanghai,engaged in mechanical and electronic equipment trade and services. 2007 lease plant 800 square engaged in machinery and electronic equipment industry,design,manufacture,installation of various pipeline after sale service. Because in 2008 the market and business needs of the company to expand the business,another rental workshop of 1500 square,the new purchase of shearing machine,bending machine,milling machine,lahte,punching,and other processing equipment. Because of the company business development is rapid,in 2009 December in the Wuhu purchase of 20000 square,self built factory building and dormitory,completed in 2012 May,plant and supporting facilities construction,2012 August Wuhu manufacturing base officially put into use. The company currently has 10 senior engineers,senior technicians 25,more than 100 staff,hav a first-class technical team and advanced production facilities. The company has Wuhu manufacturing base,Shanghai,Hefei,Chengdu,Zhengzhou,Tianjin five operation center. In recent year the company is committed to engaged in home appliance production lines,express logistics conveyor line,surface treatment production SMT/DIP related equipment,non-standard automation plane,and the entire factory automation engineering design,manufacture,installation and service. Logistics:Shen Tong,Tong,rhyme,the daily express,and established long-term cooperation partnership. We always take the customer demand as the guidance,absorbing the domestic,international advanced production planning and management technology,ideas,to help customers improve efficiency,reduce costs,create profits for the purpose,in line with the safe efficient and humanized purpose. Set up a number of business,developed a series of products,widely used in various industries,providling a large number of high-quality products and services for the production and management of a large number of modem enterprises,and strive to create high-quality brand.